Well, it looks like a good movie. The evil Baraki from D-War. The Skinny: Hahahahahahahahahahaha! Oh, sorry, I just saw D-War, and I still haven't stopped laughing. No, it's not a comedy. D-War is a bad film. So bad, in fact, that it reaches that rarefied air of badness where it's practically watchable - that is, if you enter with the correct mindset, plus a sense of irony that the film and filmmakers apparently lack. Being stoned or drunk wouldn't hurt either, and if you and your friends love playing "Mystery Science Theater 3000", then this film could be heaven, because it provides more fodder for snarky commentary than a Lindsay Lohan film festival. D-War would probably be even more fun in the cinema, as an audience full of like-minded, sarcastic junk cinema addicts would surely enhance the experience. I'm betting this thing shows up on a midnight movie slate very, very soon. If you send me a ticket, I'll go. But I'll have to be comped, because there's no way that I'm paying for this thing twice. D-War stars Jason Behr (TV's Roswell) as Ethan, a television reporter who gets drawn into an epic adventure of destiny - or so the DVD box art wants us to believe. Actually, he's the star of a manufactured storyline that bleeds wannabe creativity, but is really just a clichéd extension of an ancient Korean legend. You see, the legend talks about dragons and how one Imoogi (a snake-like Korean Dragon - look it up at Wikipedia) gets to become a real dragon (with arms, whiskers, etc.) every 500 years and somehow safeguard the universe. I'm not exactly sure what will happen if a good Imoogi becomes the Dragon, but if a bad Imoogi becomes the Dragon, then it will be very bad. So, in order to prevent bad from occurring, everyone should root for the good Imoogi. Good Imoogi becomes Dragon = good. Bad Imoogi becomes Dragon = bad. I hope you're getting this. Problem: Bad Imoogi is winning. 500 years ago, the bad one, called Buraki, sent his reptilian minions and armored human followers after the "Yuh Yi Joo", a spirtual/mystical plot device that Buraki needs to become the dragon. The Yuh Yi Joo is housed in the body of a young Korean girl named Narin, and the bad guys try to find her by completely trashing her village via fire bombs and general slaughter, and then they sift through the rubble to find Narin because they need her alive. Yep, that makes sense. Anyway, Narin escapes, but jumps to her death along with her lover/protecter Haram. As they're dying, the two promise to meet after they get reincarnated 500 years later and the whole struggle for the Yuh Yi Joo begins anew. Got all that? Good, because you're now one step up on uninitiated audience members who get this information in mind-numblingly boring fashion from Robert Forster (Jackie Brown), who shows up as an antique dealer who explains the entire Imoogi legend to a young version of Ethan while using his condescending "I'm telling a legend" voice. Sadly, the kid looks bored, which is no surprise because the story lacks coherence and/or active interest, and is handed out in the most banal way possible. Chalk this one up to bad filmmaking. But that's only the tip of the iceberg for bad filmmaking in D-War. The whole film is ineptly constructed, and is so unintentionally funny that instant camp classic status is all but guaranteed. D-War's ideas aren't poorly conceived, and could support a decent fantasy film. However, it's the execution that sinks this one. Most of the key plot points are revealed during the first twenty minutes, leaving little to discover over the course of the film. Everything is learned through spoken exposition, events occur with transparent and laughable convenience, and characters behave in inane and totally unconvicning ways. Shim Hyung-Rae, who both wrote and directed this mess, cares about his ideas, but he doesn't seem to know how to assemble them into something that can affect his audience, let alone suspend their disbelief. The film is directed amateurishly, and Shim's story and dialogue are the height of unintentional hilarity. From minute one, this is an unconvincing motion picture, from the characters to the story to even the incidental details. Without suspension of disbelief, how can an audience care? Well, they can still care about the visual effects, which are pretty good when they aren't defying physics or common sense. 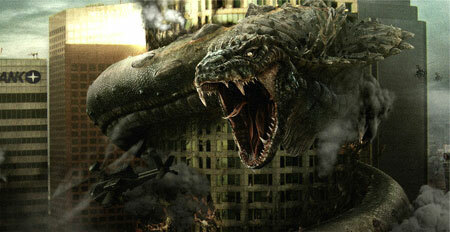 Buraki (a gigantic, Godzilla-sized snake, mind you) slithers all over LA, and yet nobody sees him or confirms his existence until the gigantic "attack of the reptiles" climax, which occurs for no narrative purpose other than to exercise the CGI budget to its maximum. The film lacks a consistent sense of scale or danger. Sometimes, people are seen running in fear from the reptiles, but other times the creatures are marching down empty LA streets like they're participating in a dry run for a Disneyland parade. The actors don't help; nobody behaves convincingly, and lead Jason Behr is remote and wooden. He accepts his fate as a reincarnated Korean warrior far too easily, and Amanda Brooks, who plays the modern bearer of the Yuh Yi Joo, suffers from a poorly-realized character and an abundance of inane "why me" dialogue. The moment when the two characters realize their love for one another is also insipid and unbelievable. I could go on and on.